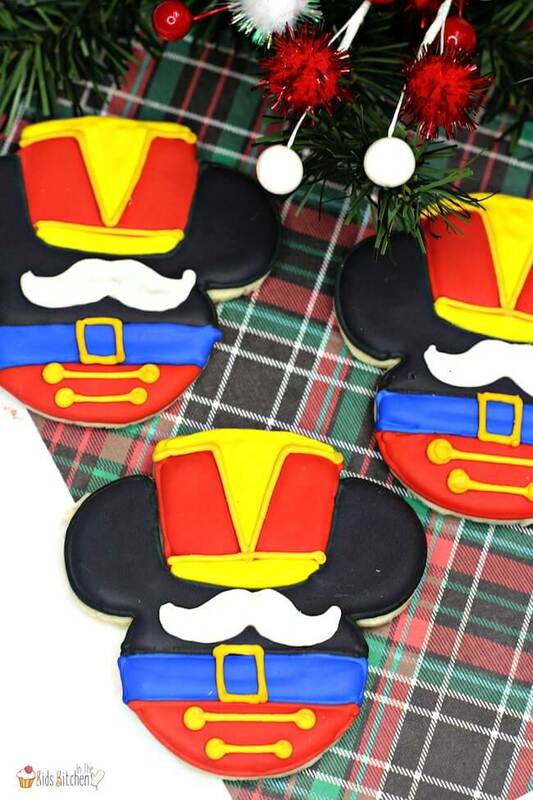 Attention Disney fans: these Mickey Mouse nutcracker Christmas cookies are just the thing for your Christmas cookie spread! This year was marked my very first visit to Disneyland (yes, at 33 years old I finally made it out there!) It was a work trip, but still an amazing time! I’ve been a Disney fan since childhood, but experiencing it in person truly was magical! So much so, that I took the rest of my family back to Disneyland just a few months later. It was my husband’s first time as well — he loved it too and we are already hoping we can return soon. Next year perhaps? After our Disneyland trip, we started noticing Disney Christmas decorations in some of our local stores. 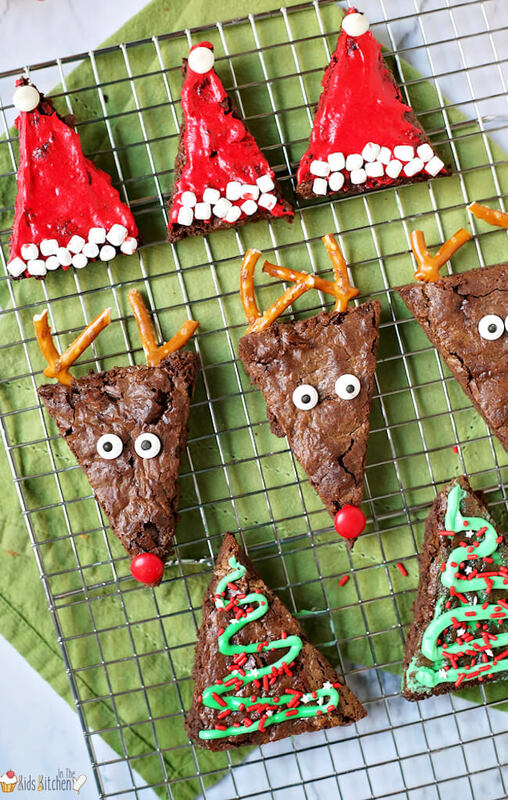 It got us thinking, how much fun would it be to do a Disney-themed Christmas at our house? It was a little too late for us to pull it off this year, but we’re planning ahead for next year and hope to bring a little bit (or a lot) of Disney magic to our home next Christmas! 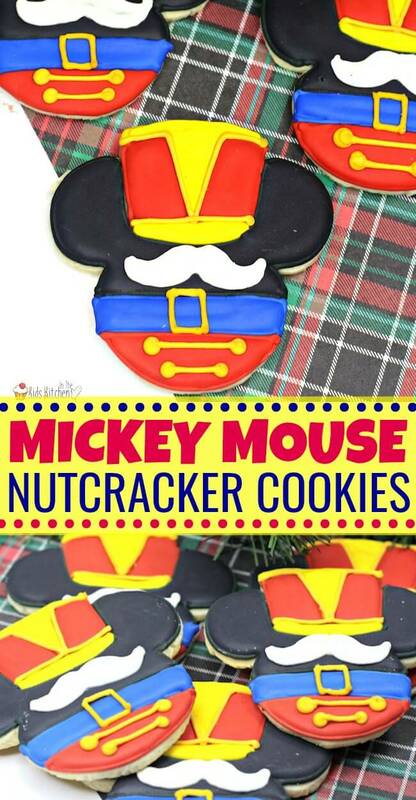 These Mickey Mouse Nutcracker cookies combine two of my favorite things! Every year as a kid, my Grandma and Grandpa would gift each of us cousins with a special nutcracker. Over the years we amassed quite impressive collections! I still take note of unique nutcrackers when I’m Christmas shopping, and it takes a LOT of restraint not to buy them all! 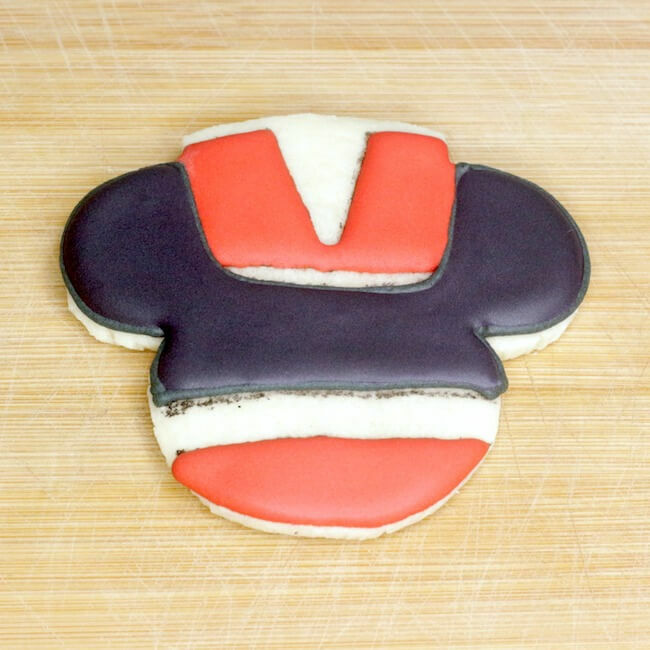 If you’re a Disney fan too, then I hope you’ll love these Mickey Mouse Nutcracker Sugar Cookies as much as I do! They are a little bit of a labor of love, but the end result is so stunning! 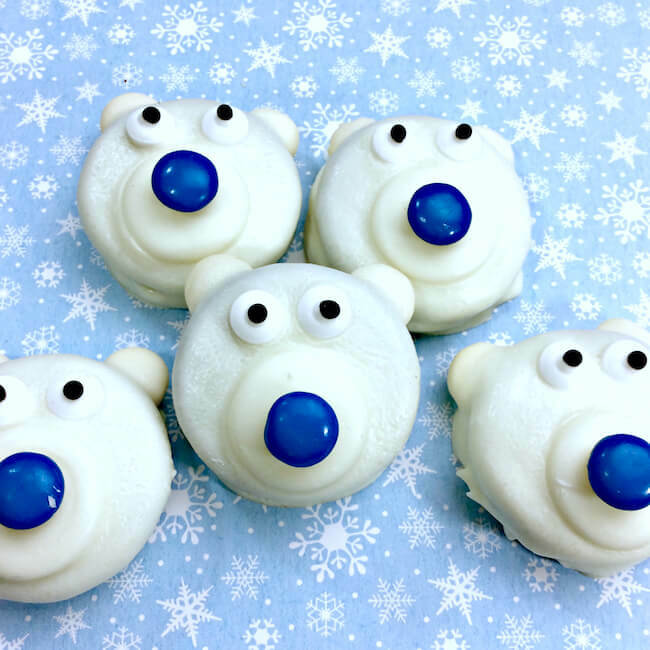 They’d make an amazing food gift for any Disney fan in your life! 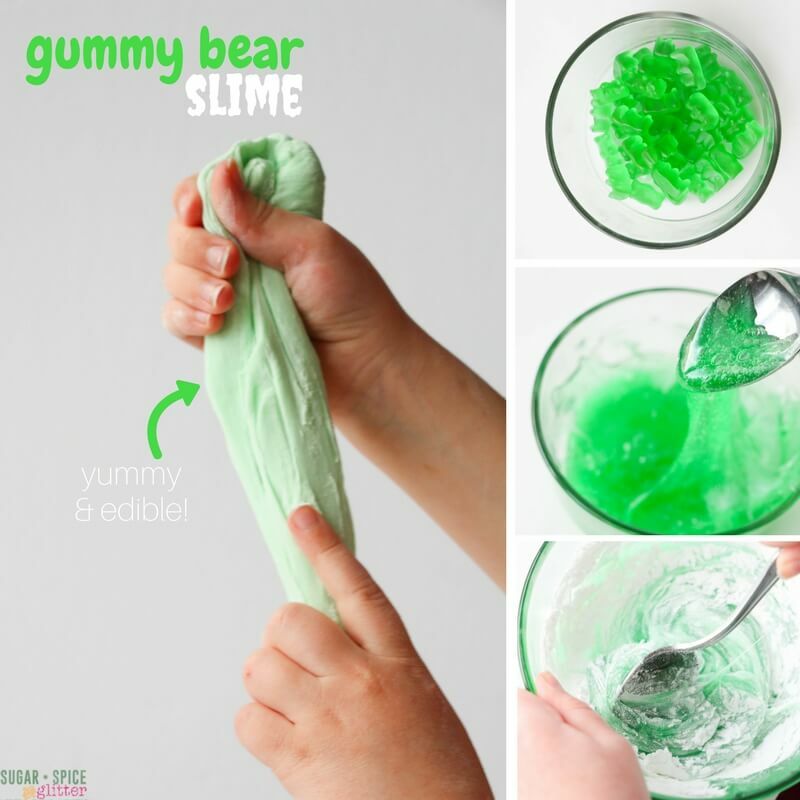 Related: Check out our collection of 50+ Disney Recipes for Kids too! 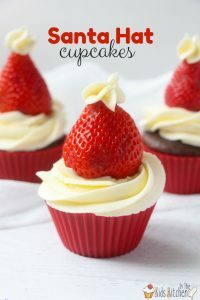 A free printable copy of this recipe, along with full ingredient list and directions is available at the bottom of the post. 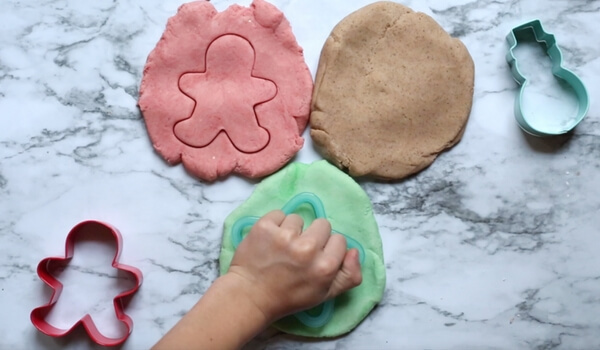 The full baking instructions are available in the printable recipe card at the bottom of the post – however, I wanted to show you how we frosted the cookies. That way the written directions will make more sense! We took each color of icing and split it into two portions. About 1/4 cup of each color icing went into a plastic piping bag, as is. 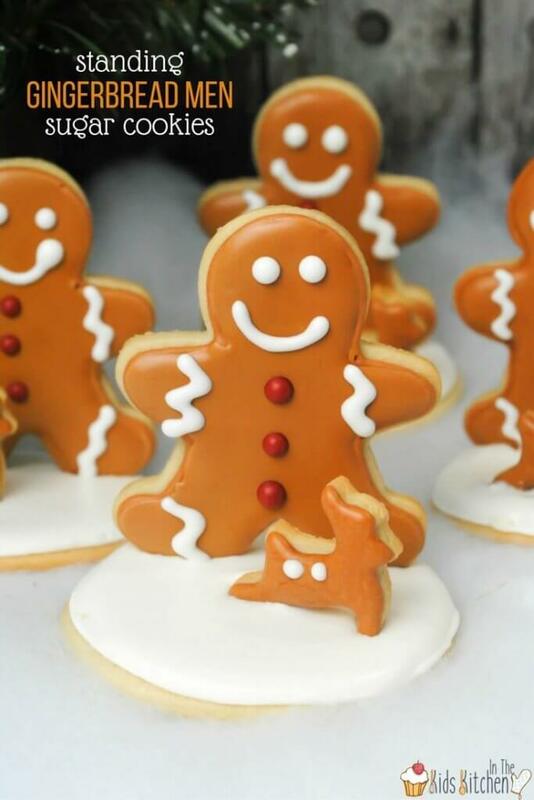 This thick icing is used to outline each section on the cookies. 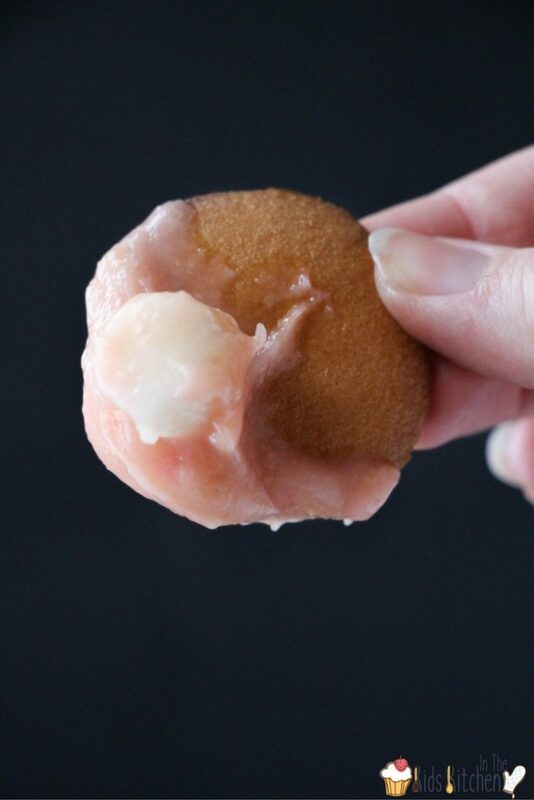 We mixed about 2 teaspoons of water into each bowl of icing, to thin it slightly. Then we scooped each color of thinned icing into its own squeeze bottle. 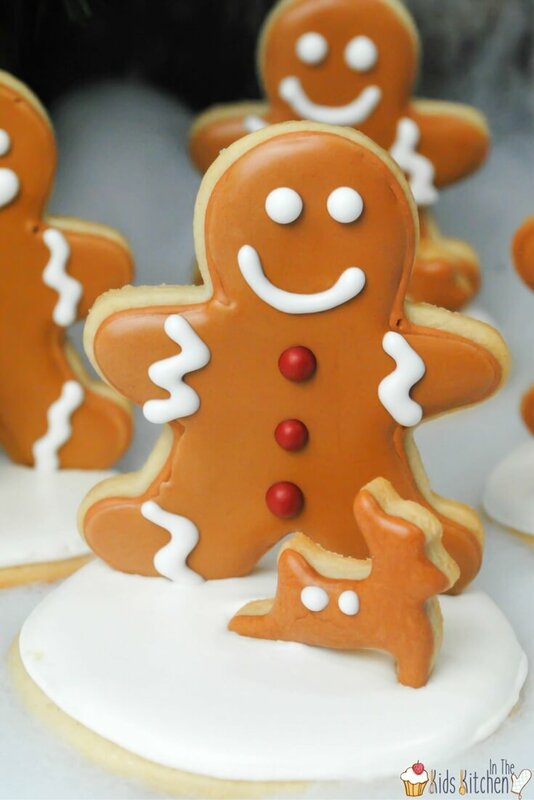 The thinner icing is used to fill in each section on your cookie, matching the color of each outline you made. 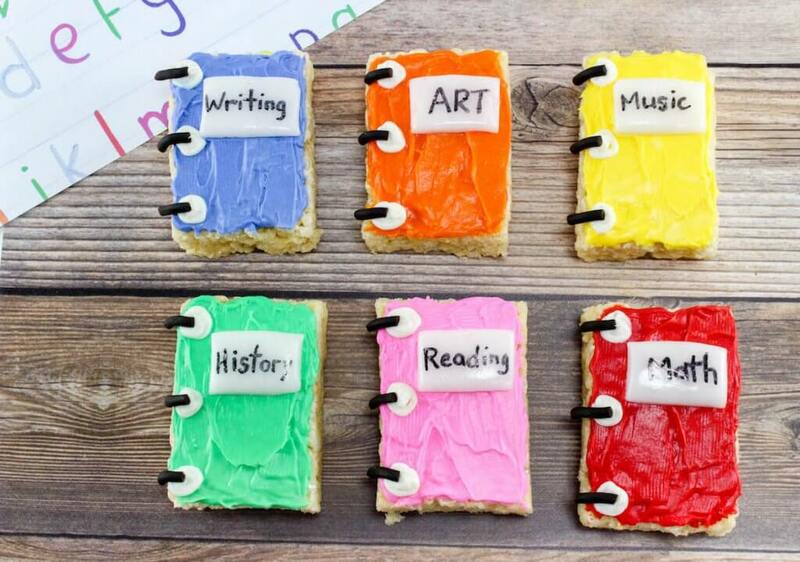 We did each color one at a time, allowing the frosting to set in between so it wouldn’t mix. 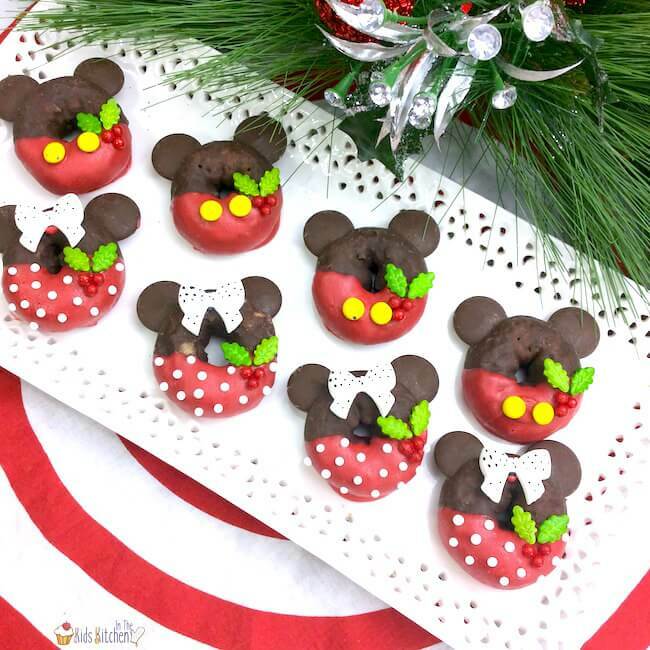 So while these Mickey Mouse Christmas cookies took a bit of TLC to make, the end result is just fabulous! 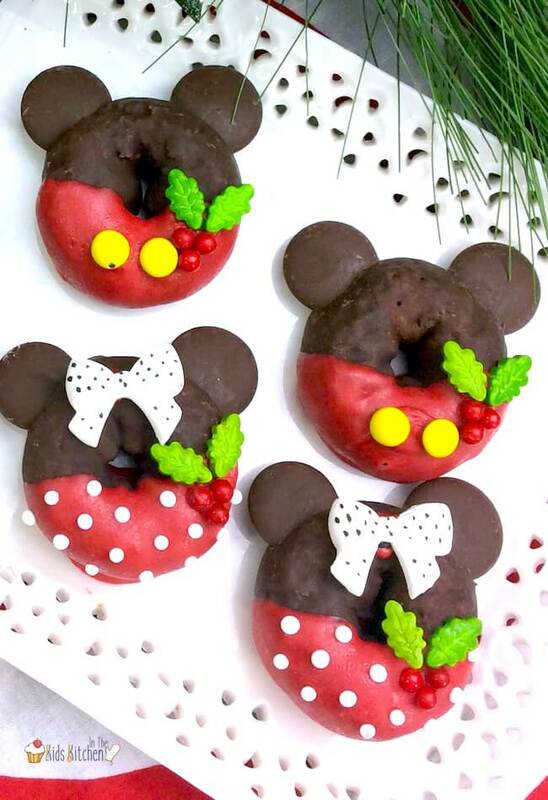 Related: You might also love our Mickey and Minnie Christmas donuts too! 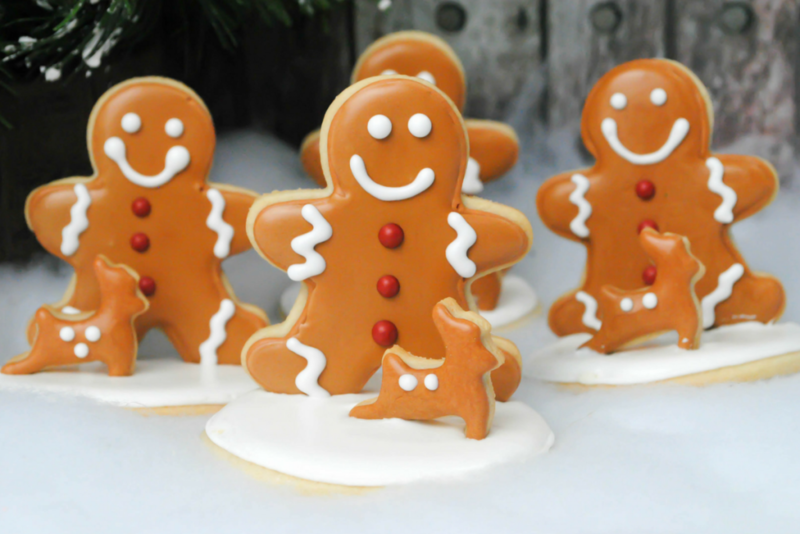 Super cute Mickey Mouse shaped cookies decorated like Christmas nutcrackers. 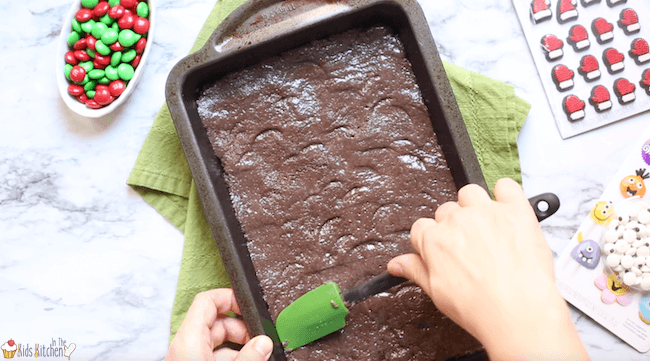 Prepare a cookie sheet with parchment paper or non-stick silicone baking mat and set aside. Using a standing mixer, cream together the butter, powdered sugar, vanilla and egg until smooth. 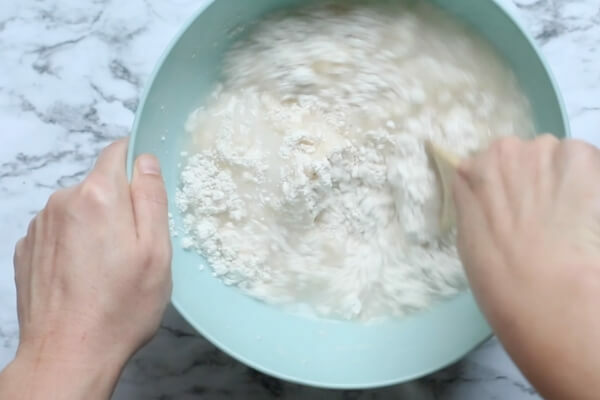 In a separate large mixing bowl, combine flour, baking soda and cream of tartar. 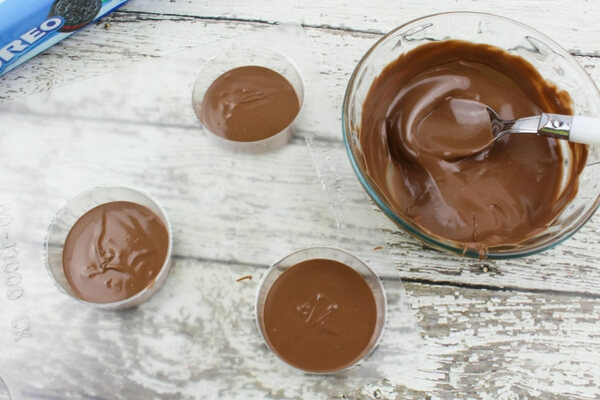 Gradually add dry ingredients to the bowl of wet ingredients, mixing on low speed. 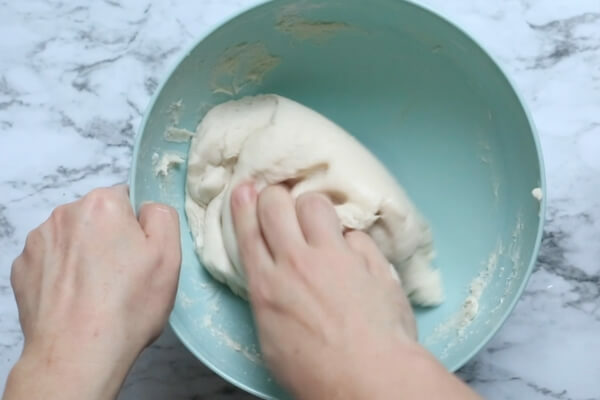 Use your hands, if needed, to knead dough until well combined. Lightly flour a cutting board and knead the cookie dough into the flour a couple times. 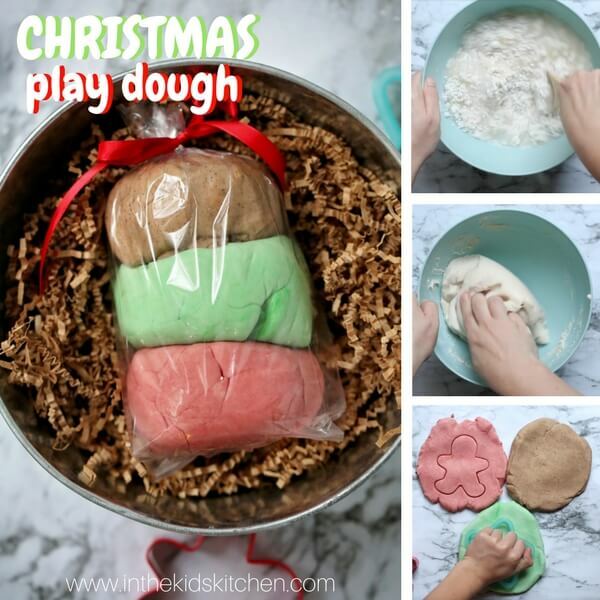 Roll out the dough to about 1/2 inch thick. 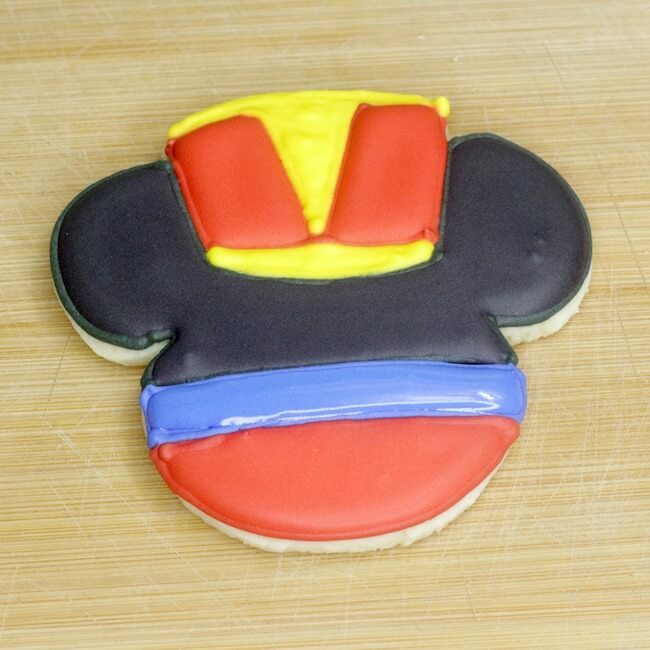 Cut out 12 Mickey shaped cookies and place onto your prepared cookie sheet. Bake for 8 minutes or until light golden brown. Repeat above steps until completely out of dough. 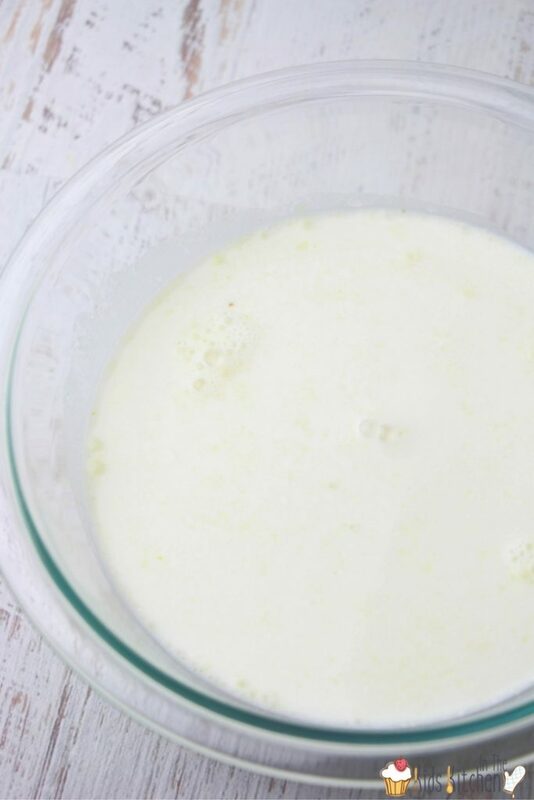 Using a standing mixer or electric hand mixer, combine the egg whites, cream of tartar, vanilla and powdered sugar until well combined and stiff peaks form. Split icing into 5 bowls. Mix each bowl until the colors are smooth and rich. 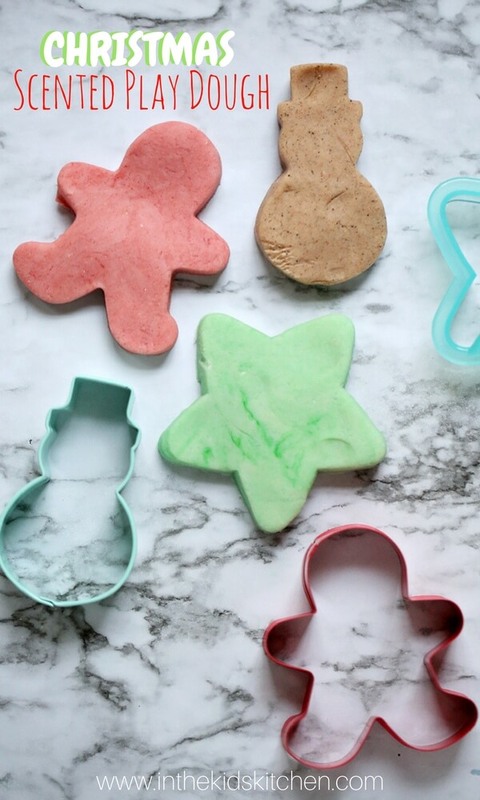 Scoop about 1/4 cup of each icing colors into a piping bag. 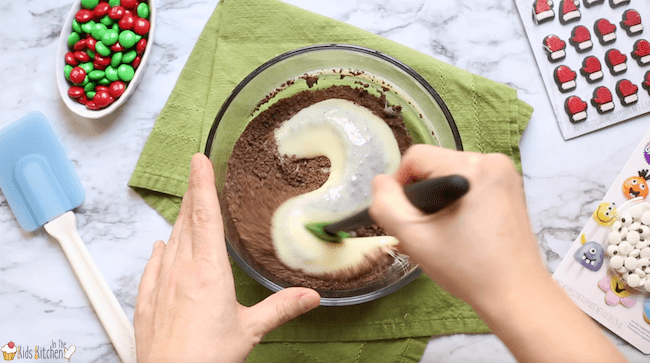 Mix 2 teaspoons of water into the bowls of remaining Red, Blue, Black and Yellow icing colors. 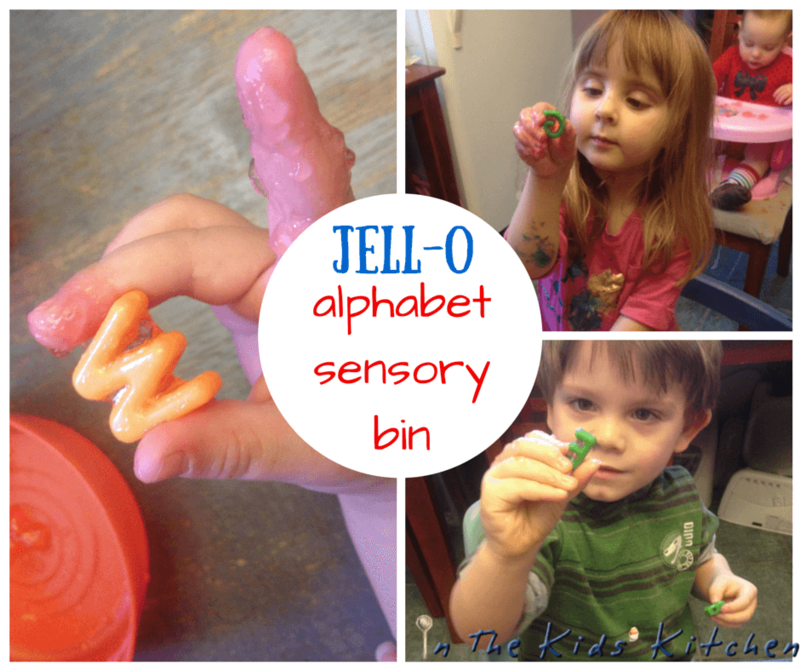 Pour each color of thinned icings into their own squeeze bottles. 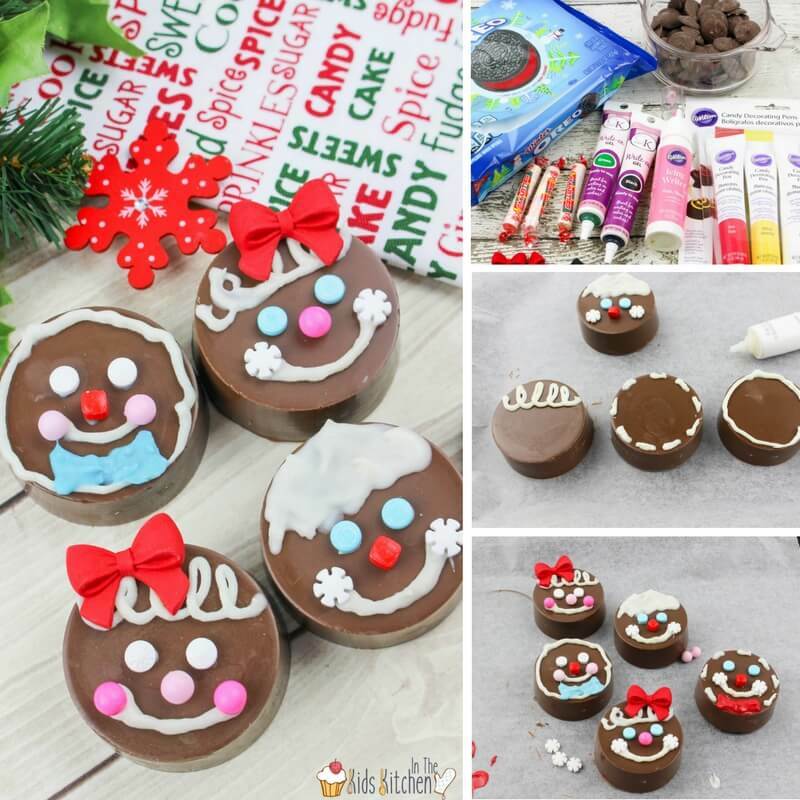 Using the edible marker, draw out the details of the cookie. 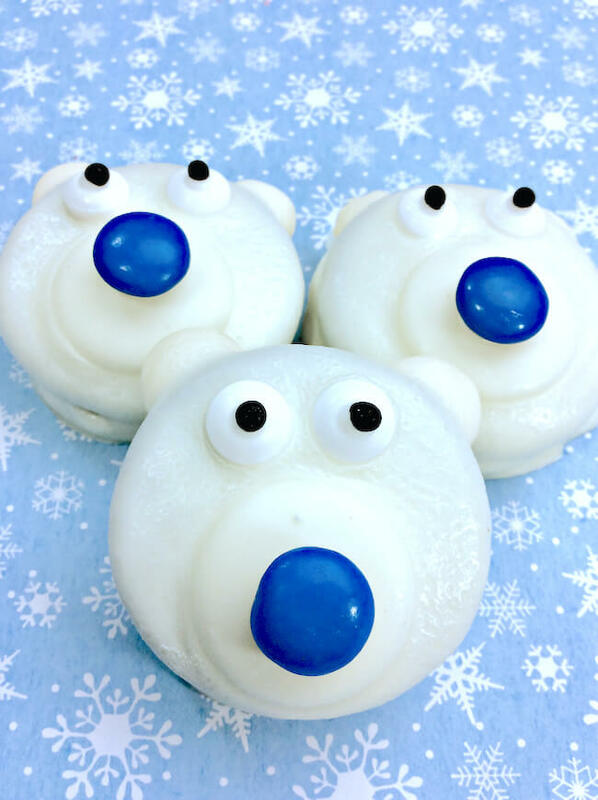 Use the black piping bag of thick icing to draw the outline of the ears, then fill in with the thinned icing. 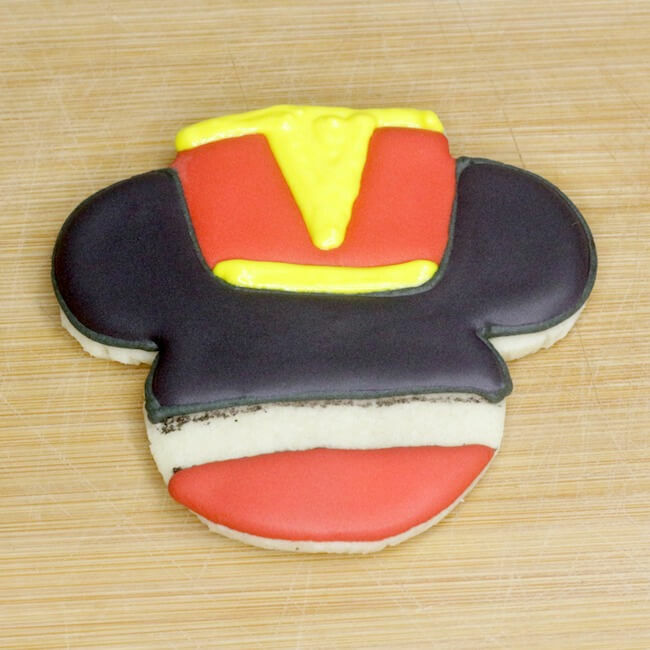 As you did with the black icings, use the red icing to outline and fill in the red detail of the hat and lower part of the cookie. Using the Yellow icing, outline and fill in the yellow detail of the hat. 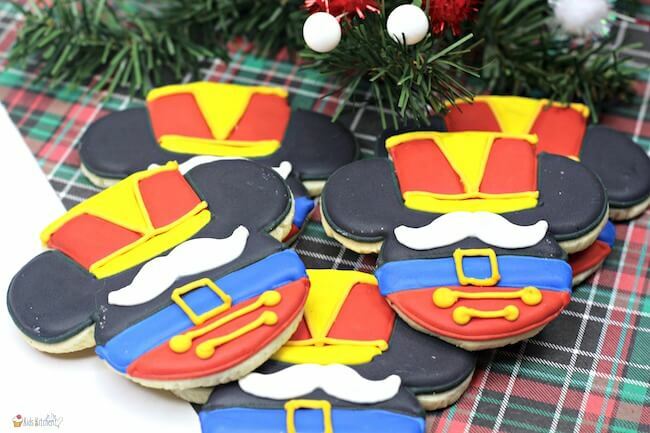 Using the yellow piping bag, pipe the details of buttons and buckle on the pants and hat. Allow cookies to completely set and enjoy! 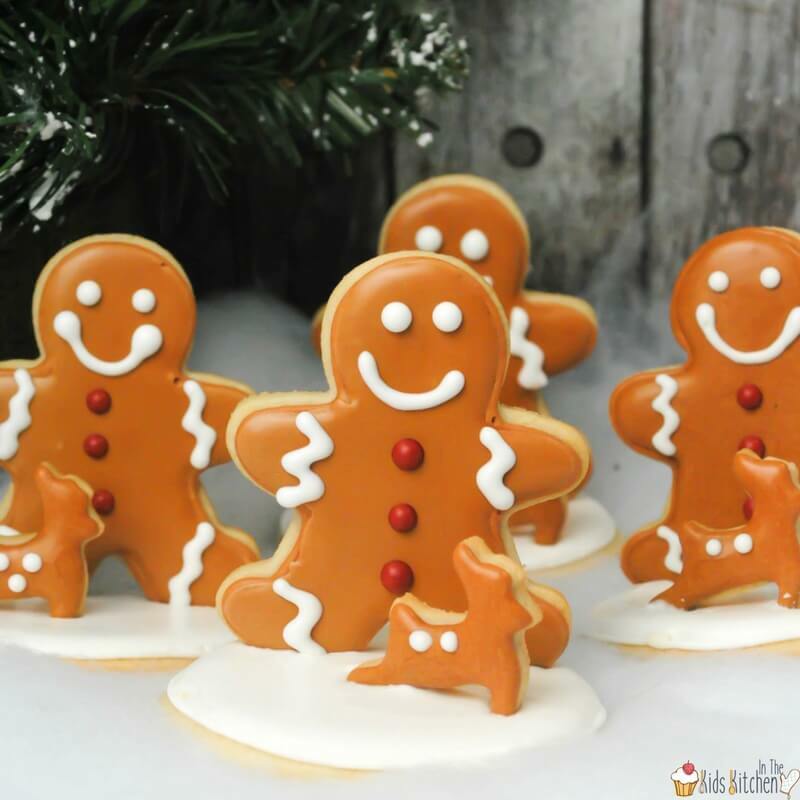 Inside: Perfect for parties or celebrating as a family, you’ll find so many goodies in this collection of Christmas Recipes for Kids! I have so many childhood memories that revolve around food and family. 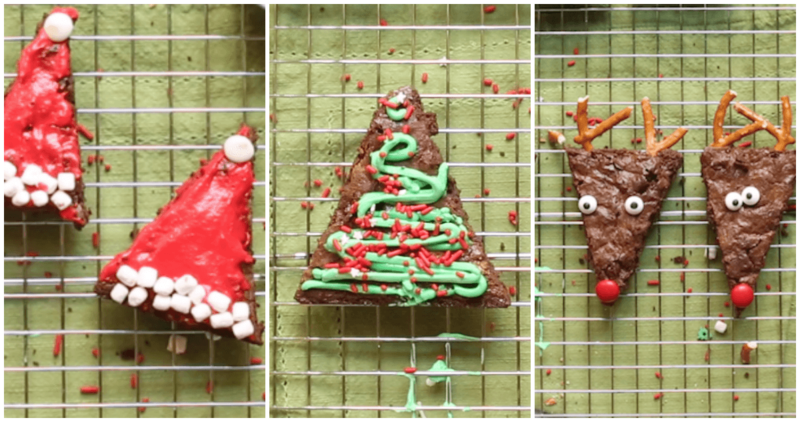 We had a full line-up of family events during Christmas week: cookie-making day, Pizza and Chinese food day, Christmas Eve dinner and Grandma’s, and Christmas dinner at Granny’s. As you can see, food played a big role in our holidays! 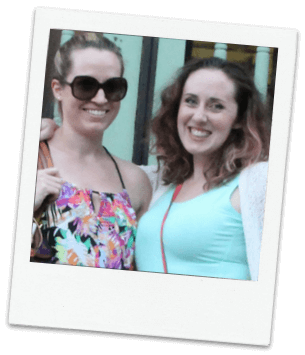 Now that I have kids of my own, I try to make the holiday season just as magical for them as it was for me. We’ve started our own cookie making tradition with my mom and sister. We have tamales on Christmas Eve (a tradition in my husband’s family), and Christmas dinner with the whole family. 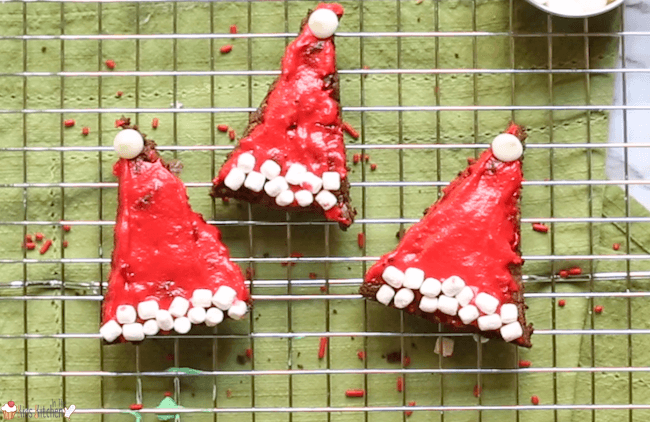 We pretty much spend the entire month cooking and enjoying holiday treats together! 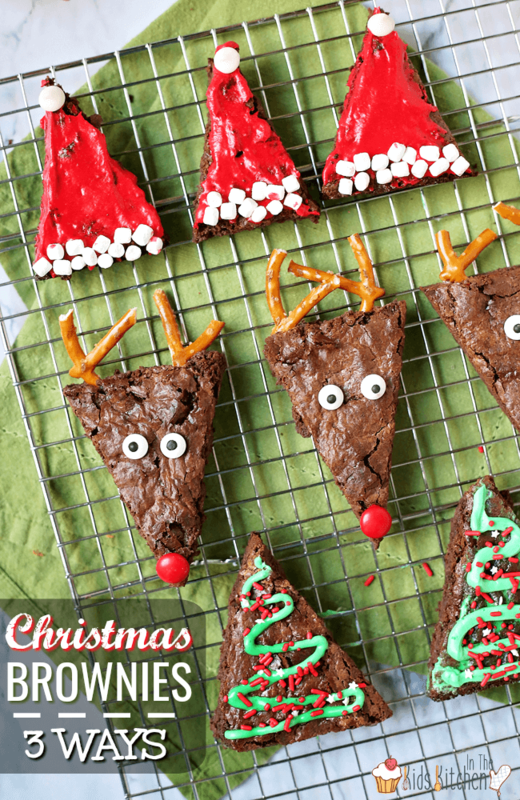 This collection of Christmas recipes for kids includes some of our family favorites, as well as contributions from some of our blogger friends. 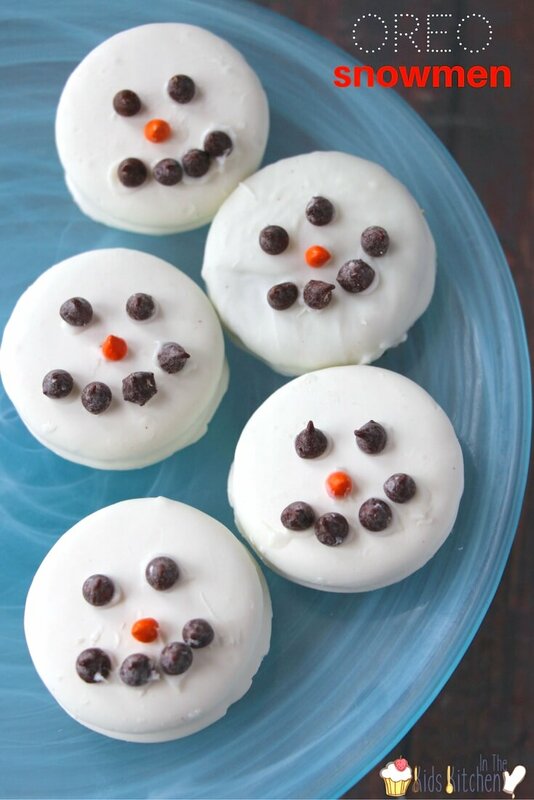 These Christmas recipes are so much fun for kids…and the young-at-heart! 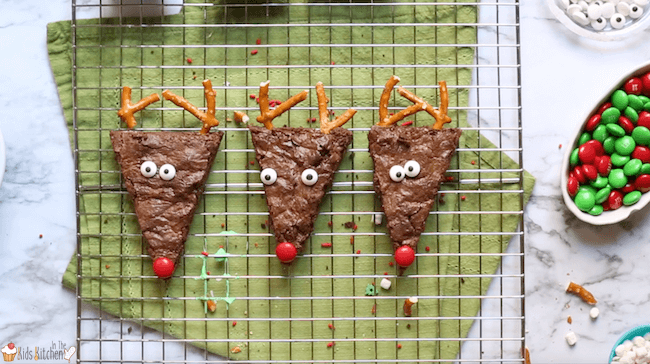 For easier searching, we’ve grouped the Christmas recipes for kids into sections based on the type of treat, from cookies to cupcakes to candy. Enjoy! 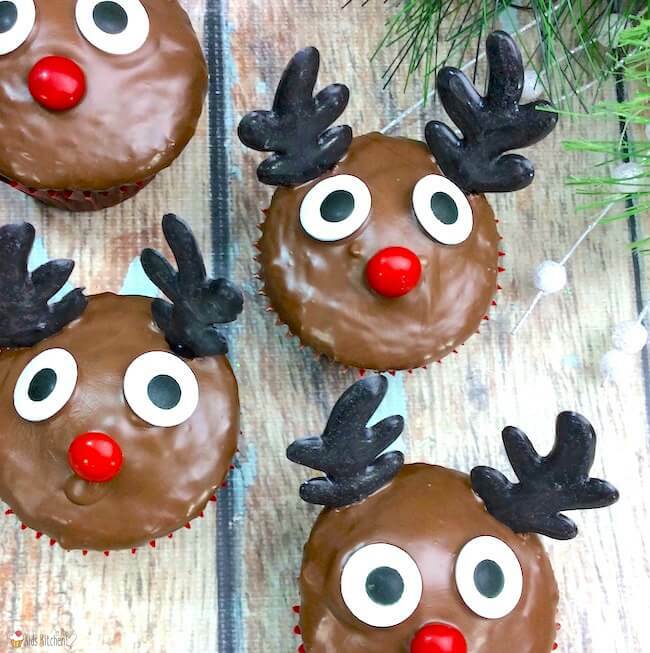 Inside: Try this cute and easy technique to turn ordinary cupcakes into a festive reindeer cupcakes! 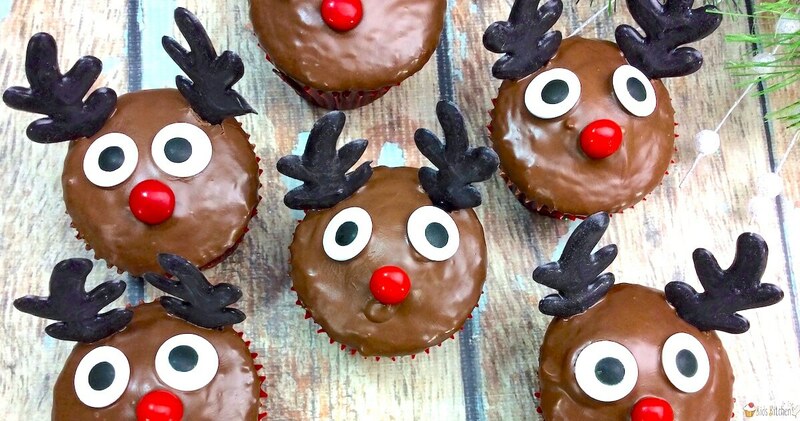 I originally published these adorable Rudolf Cupcakes on my own site, but I love them so much that I had to share here too! 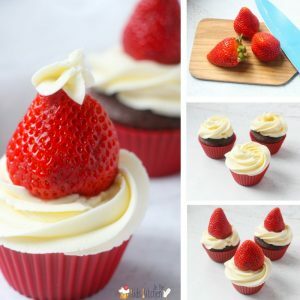 I’ve included a recipe to make your own cupcakes, but you can also save time by decorating unfrosted store-bought cupcakes. Preheat oven to 350°F and prepare cupcake pan. 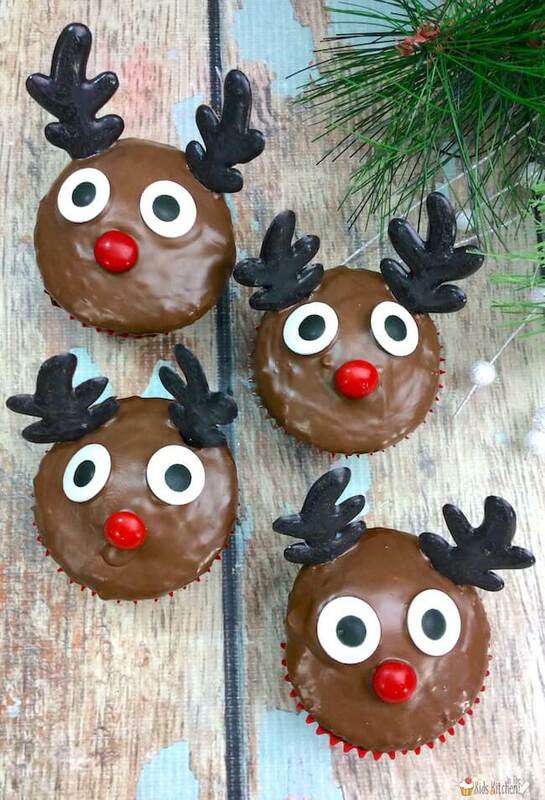 Pour melted black candy into a piping bag and use to fill in the antler outlines you drew. 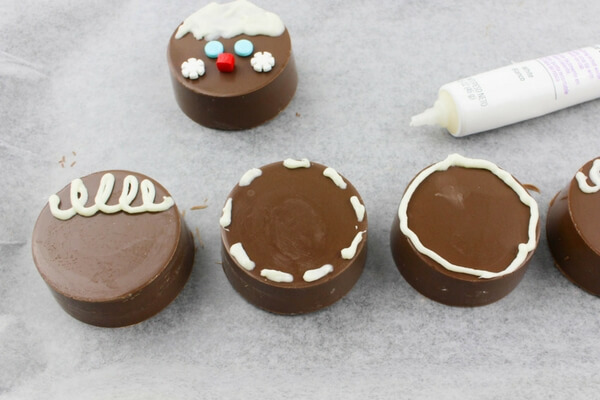 Note: If you don’t have an edible marker at home, you can totally freehand your antlers too. Tracing an outline simply helps keep them the right size. 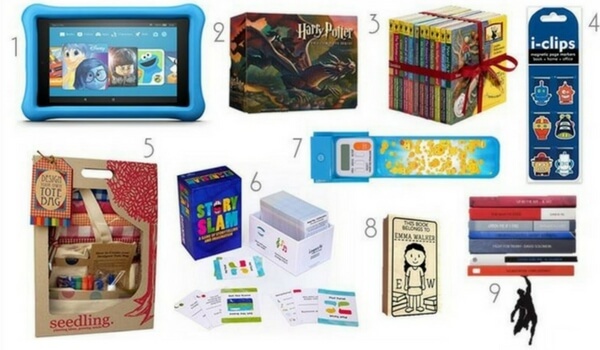 What’s Inside: Want to get something besides books for your young reader? 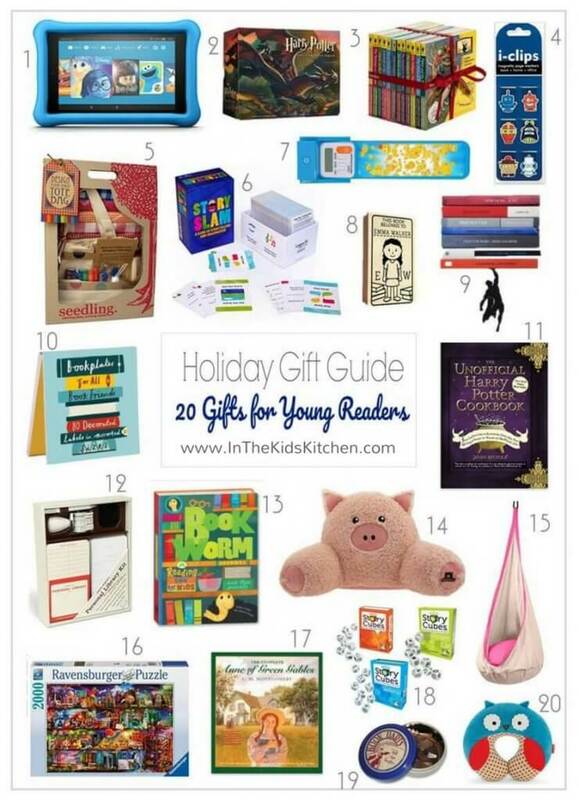 You’ll love this list of handy and helpful book lovers gifts! Whether you are shopping for a voracious reader or a budding one, nurturing a love of reading is never a bad idea. Most avid readers will have a wishlist of books to share with you – but if you want to help them create a special reading nook we have wonderful cozy additions like a hanging hammock pod. Or maybe you want to bridge the gap between their love of reading and family time with some literacy-based games? A tote bag to carry all the books, a mini bookshelf to keep books close at hand, or clever bookmarks are all great ideas. We also made sure to have ideas for every budget – so whether you’re reading to splurge on a tablet or want to focus your funds on building their book collection, we have found something perfect for you to put under the tree. 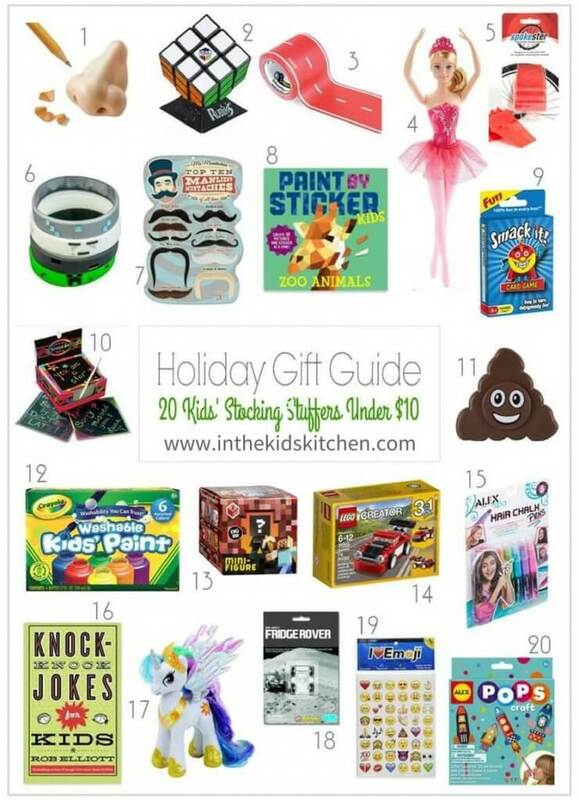 Pin this awesome collection of gift ideas for the next time you have a little reader to shop for! 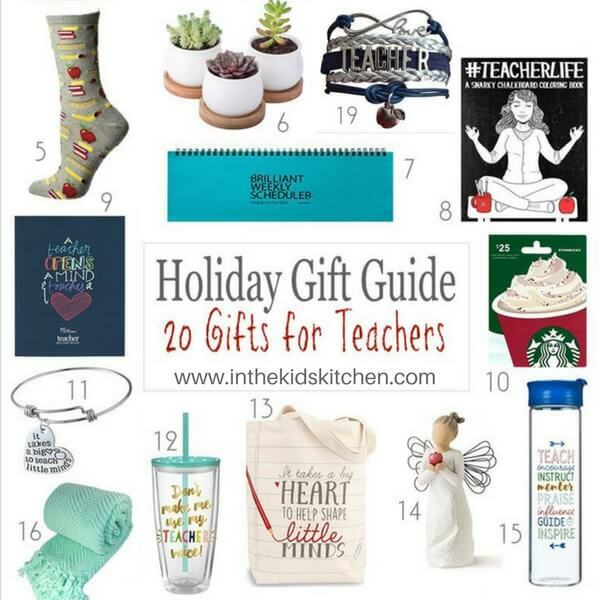 What’s inside: Whether you’re shopping for a teacher friend or trying to come up with a thoughtful idea for your child’s teacher, we have you covered with these 20 Thoughtful Teacher Gift Ideas…suggested by teachers! We asked the teachers in our lives what they would want the most for Christmas and – surprise, surprise – most of the suggestions were things to make their teaching life easier. Planners, tote bags, stationary and gift cards topped the list – along with wish list items for their individual classrooms. 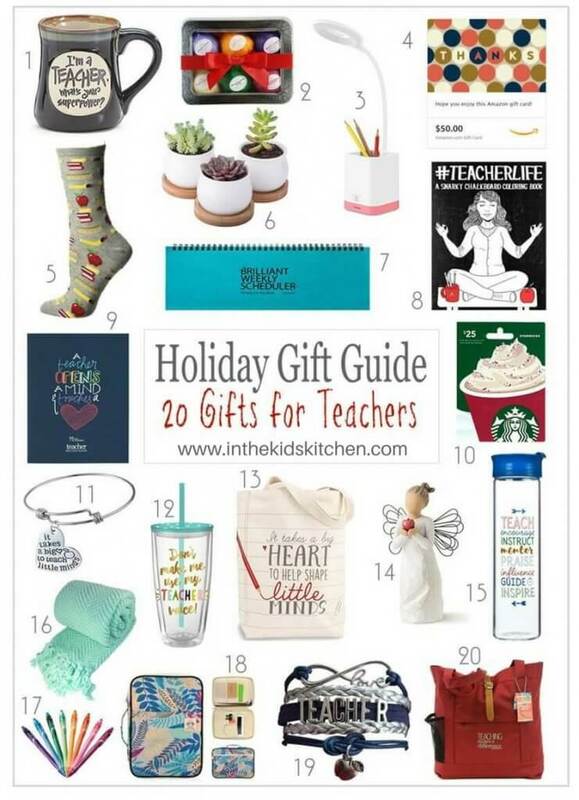 But knowing how tired some of our teacher friends are at the end of the day, gift cards to healthy restaurants, coffee gift cards and durable water bottles also made the list – along with some awesome relaxation gifts, like a teacher coloring book and essential oil bath bombs. 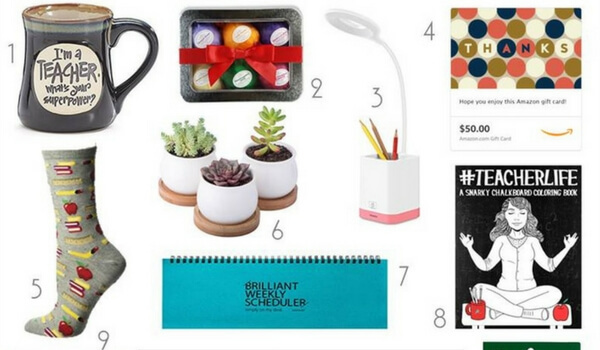 Be sure to pin this collection of teacher gifts for the next time you need to buy gifts for the teachers in your life – there’s so many opportunities to show appreciation for teachers on holidays, Teacher Appreciation Day and the last day of school – and of course, their birthdays! 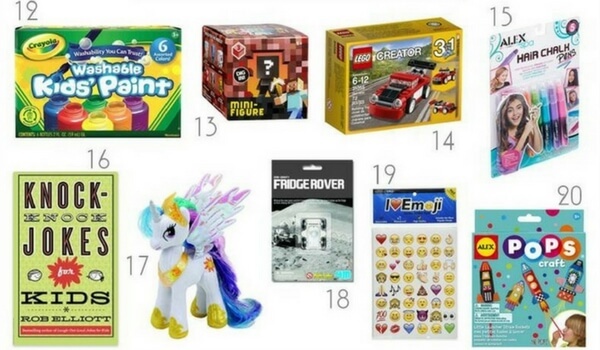 What teacher gift ideas would you add to this list? 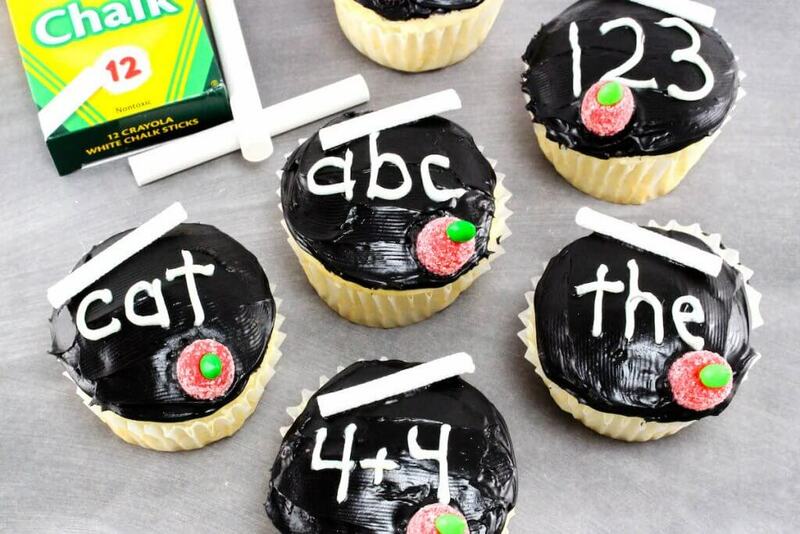 For some homemade teacher presents, check out our School Book Rice Krispie Treats or our Chalkboard Cupcakes. 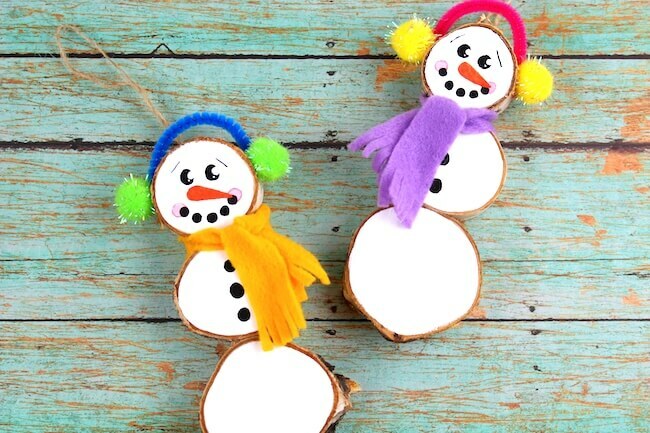 Inside: These rustic wood slice snowman ornaments are adorable kid-made decorations or Christmas gifts! 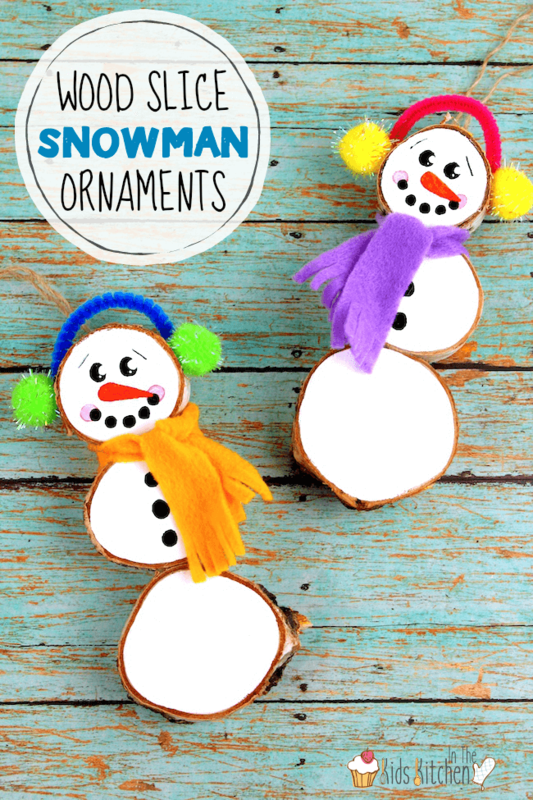 A lot of kid-made ornaments aren’t very durable, but these sturdy wood slice snowman ornaments are meant to last! 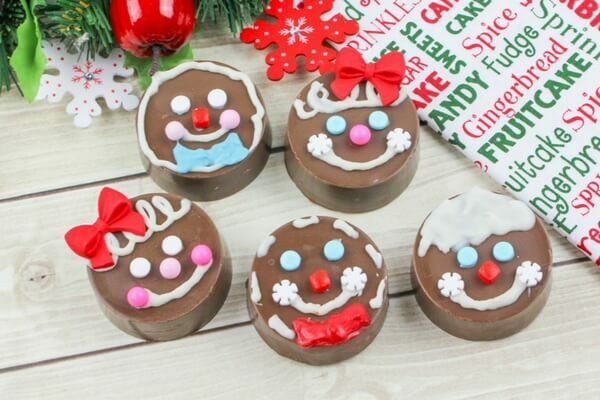 They’re a cute Christmas keepsake that kids can make for their own tree, or to gift to family, friends, and teachers. 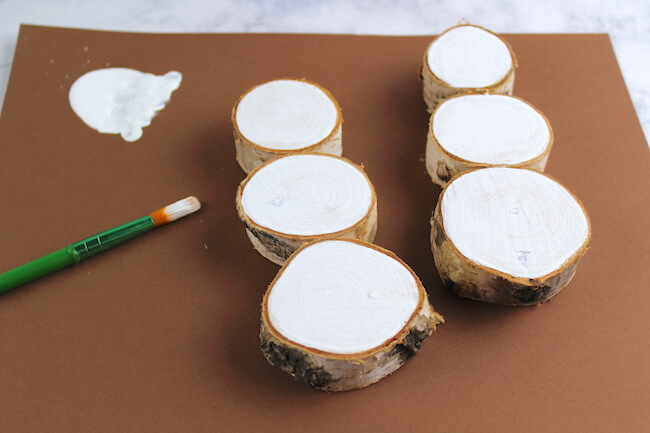 Paint the front of your wood slices white and allow to dry completely. This may take two coats for best coverage. Cut a pipe cleaner large enough to wrap around the snowman’s head, leaving some empty space above his head. This is the band for the earmuffs. Glue a pom pom on each end of the pipe cleaner. Cut a long thin piece of felt for a scarf. 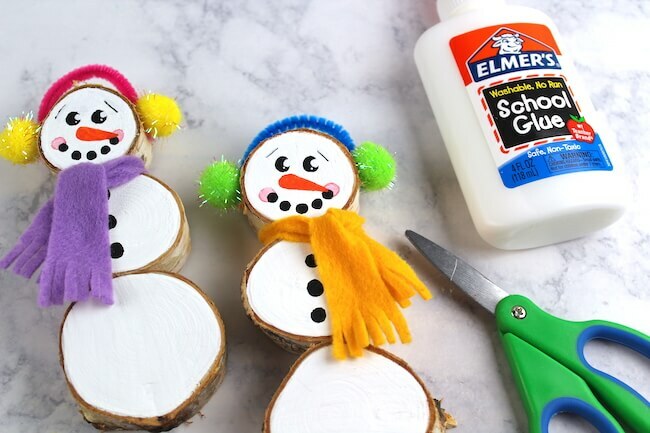 Tie around the snowman’s neck and glue to secure in place. Use scissors to frays the ends of the scarf. 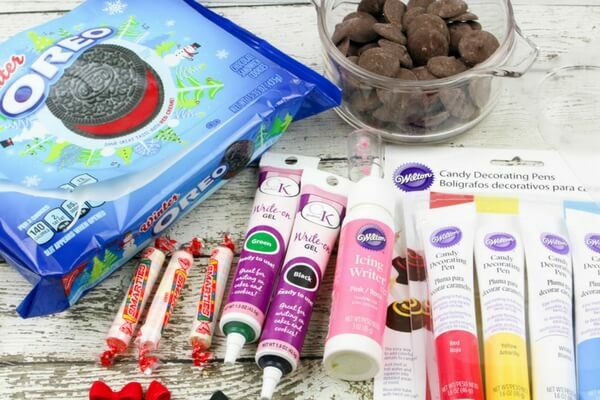 There are so many fun traditions around Christmas stockings – I had no idea there were so many different ways to do it. Some families open one gift from the stocking for the 12 Days of Christmas, while others open them all on Christmas Eve. My family always just lumped it in with the other Christmas gifts on Christmas morning but I think we might be switching it up this year. How does your family do Christmas stockings? * Note: All items listed were under $10 at the time of publication, though sellers may change prices without our knowledge. 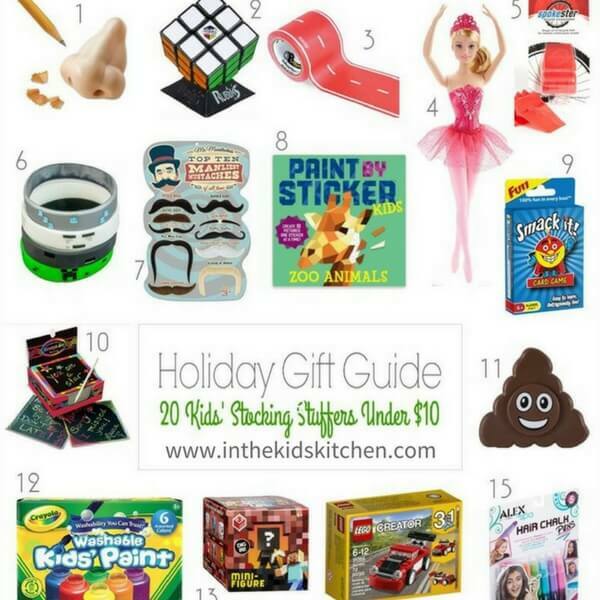 Be sure to save this list of Christmas stocking stuffers for when you need some shopping inspiration! 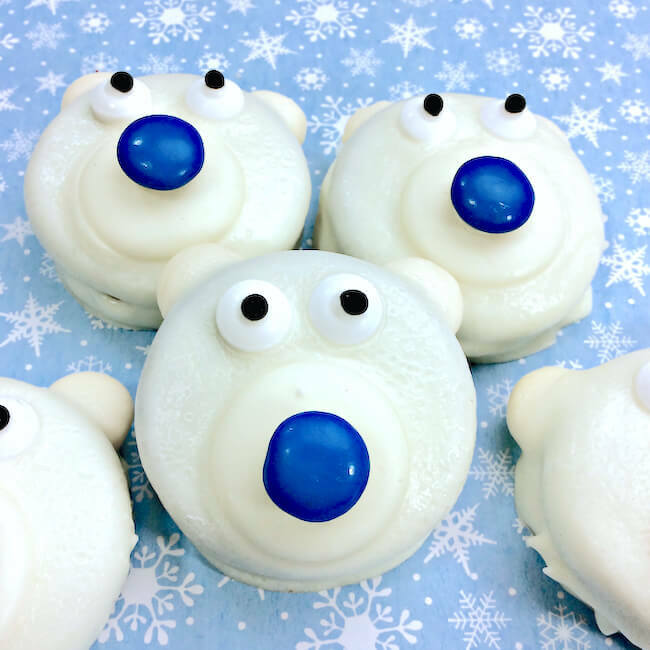 For more fun holiday ideas, check out our Mickey & Minnie Christmas Donuts or our 5-minute Peppermint Fluff dip. 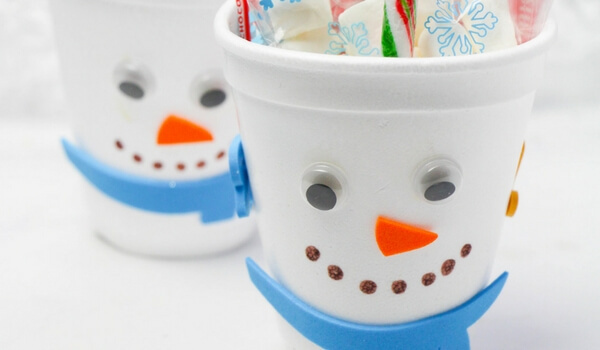 Inside: A cute classroom gift idea for Christmas, this Snowman Hot Chocolate Gift Set is one kids can make, and it’s thrifty too! 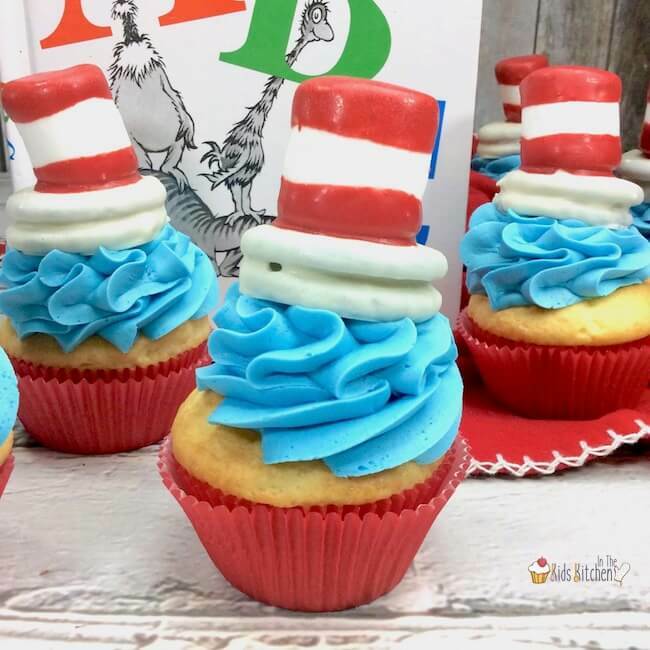 Coming up with a classroom gift idea that is affordable yet special can be a real challenge – especially with larger classroom sizes! 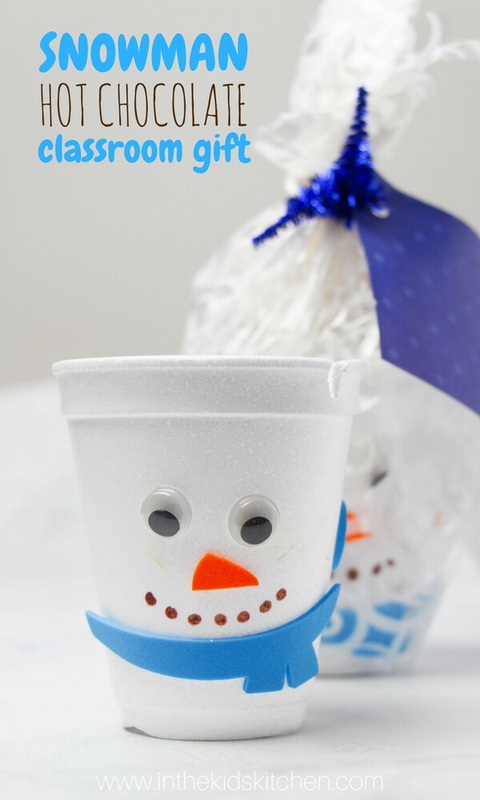 This Snowman Hot Chocolate gift idea was a fun craft and gift rolled into one – and comes in at under 50 cents a present! 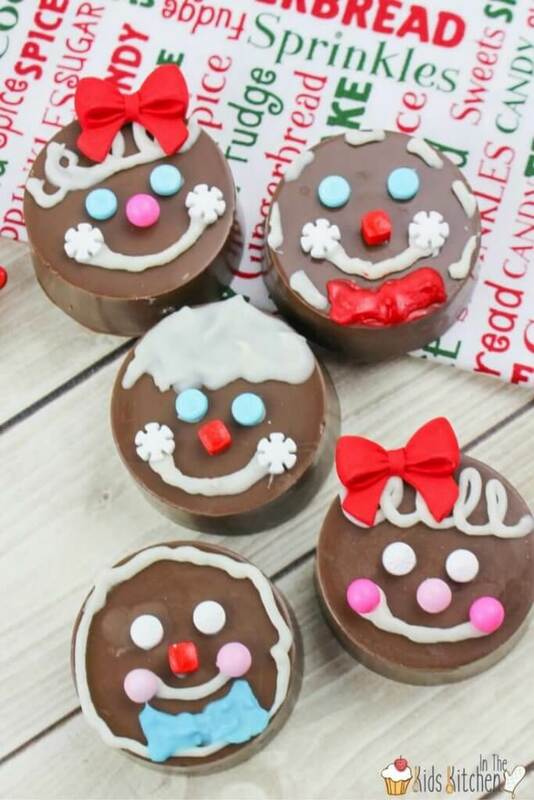 I love putting together little treats for my daughter’s class at the holidays – give me a theme and I will run with it! However, in a class of 27 kids, I need to come up with simple ideas that are budget-friendly. Making 27 gifts can easily lose it’s appeal, and can easily add up if you’re not careful! For 27 kids, we bought a giant pack of hot chocolate, 3 boxes of candy canes (with plenty left over), 1 bag of cups (with extras for crafts or entertaining), a bag of mini marshmallows and a package of cute snowflake baggies. 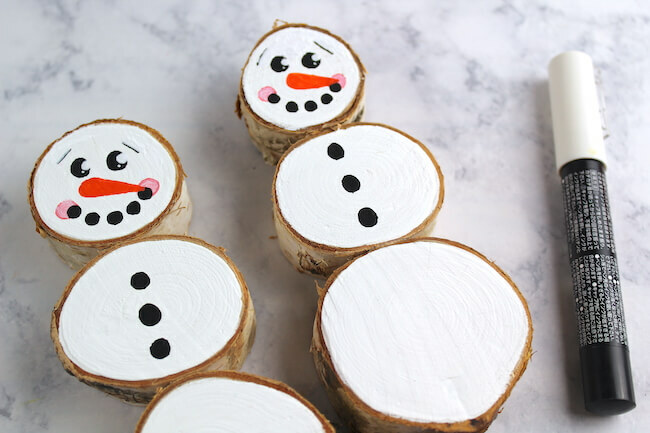 We already had foam and googley eyes on hand but even if you needed to purchase them these snowmen hot chocolate sets are still super cheap to make. While the glue was drying on all of the cups, we divided up the marshmallows and filled the cups. We decided to not wrap ours in cellophane but it would be quick and easy to wrap them up – and I show an example of what that can look like below. 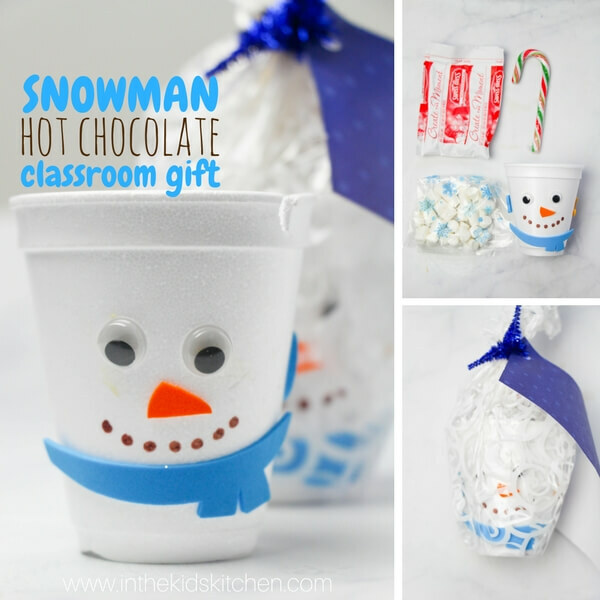 These Snowman Hot Chocolate gift sets were so much fun to make and I can’t wait to hear how much the kids loved them! Cut out scarfs and noses from the foam. 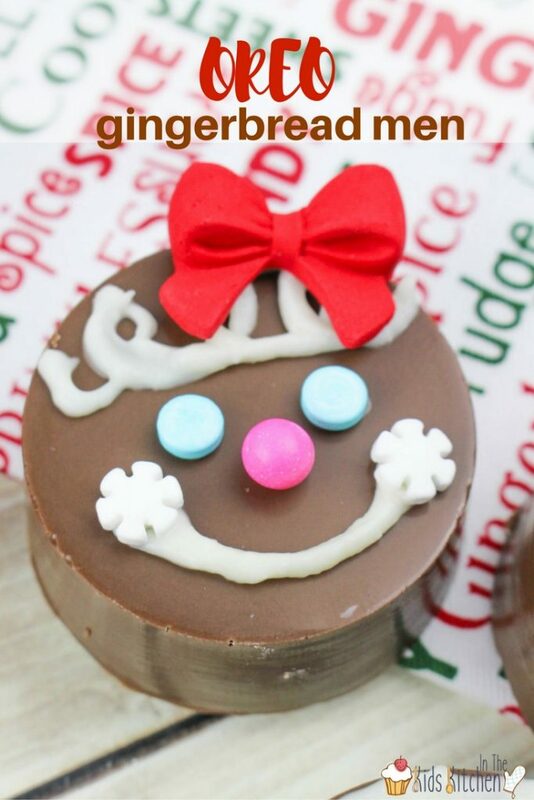 Glue the googley eyes, scarves and carrot noses on the cups. Draw the mouths on with the marker – plus any additional details you desire. 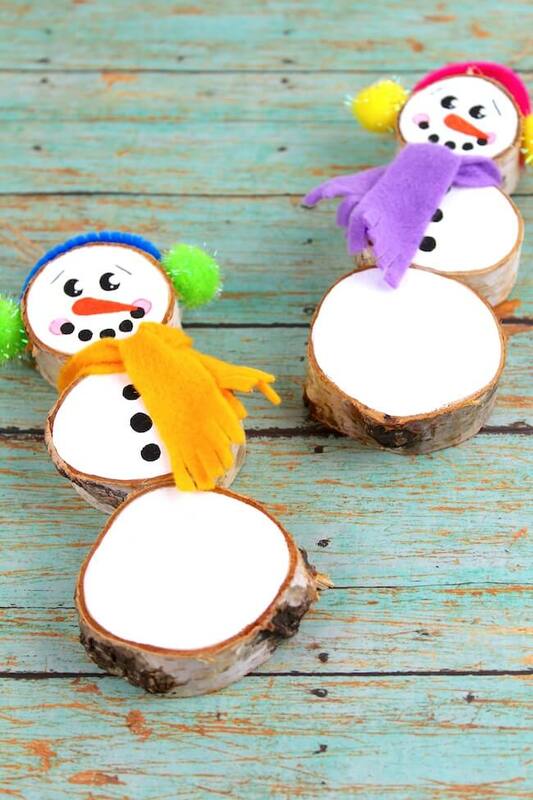 Optional step: add names using the marker or foam letters to ensure that all friends receive a snowman. 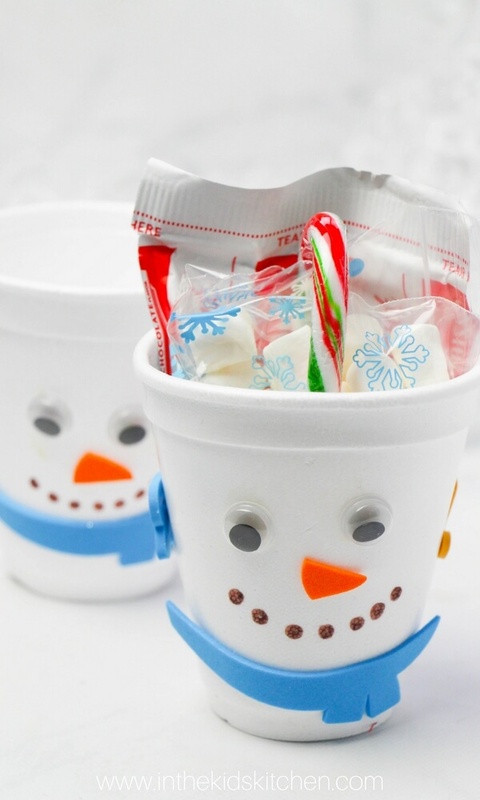 Place a hot chocolate packet, candy cane and marshmallow bag in each cup. Optional step: you can wrap the cup with a bit of gift paper and secure with a pipe cleaner. 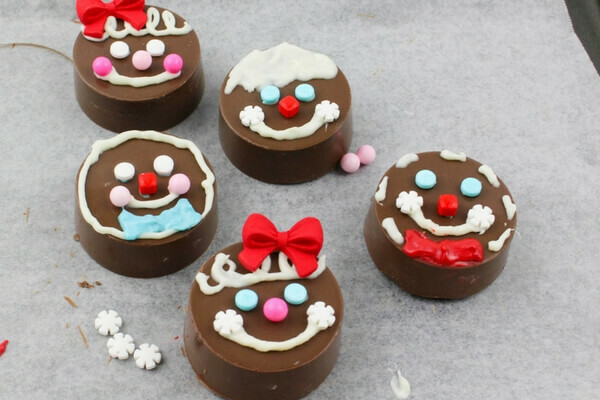 Start by making the snowman cups. Draw the mouths on with the marker - plus any additional details you desire. 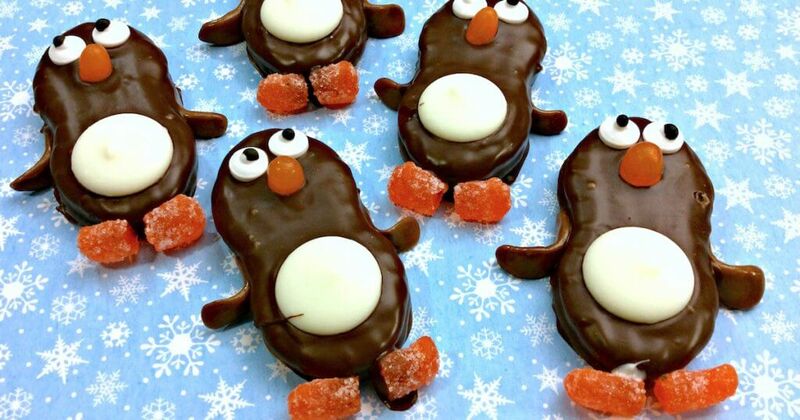 For more fun winter recipes, check out our Nutter Butter Penguin Cookies or our Easy Polar Bear Cookies. 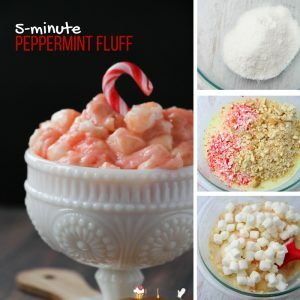 My kids love homemade fluff dip so I thought I’d give our recipe a peppermint twist with this delicious 5-minute Peppermint Fluff recipe. 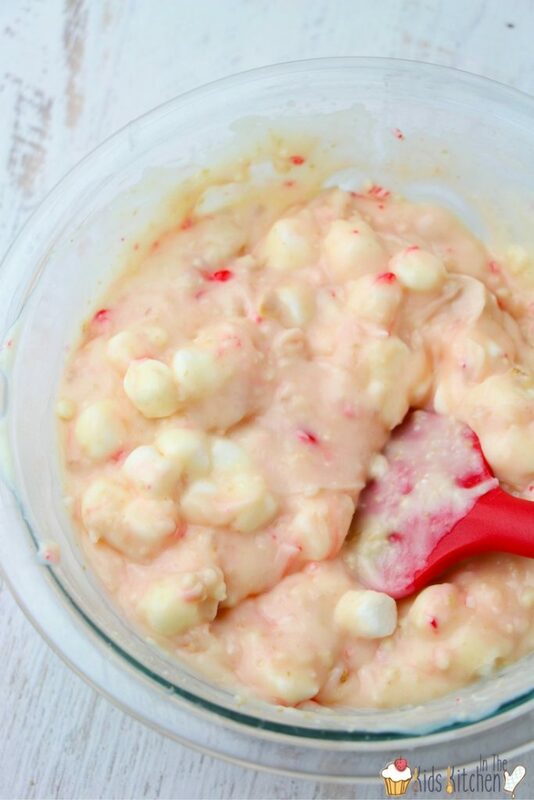 So what exactly is “fluff?” Fluff is a sweet dessert dip (often marshmallow based) — and everyone seems to have their own favorite combination! 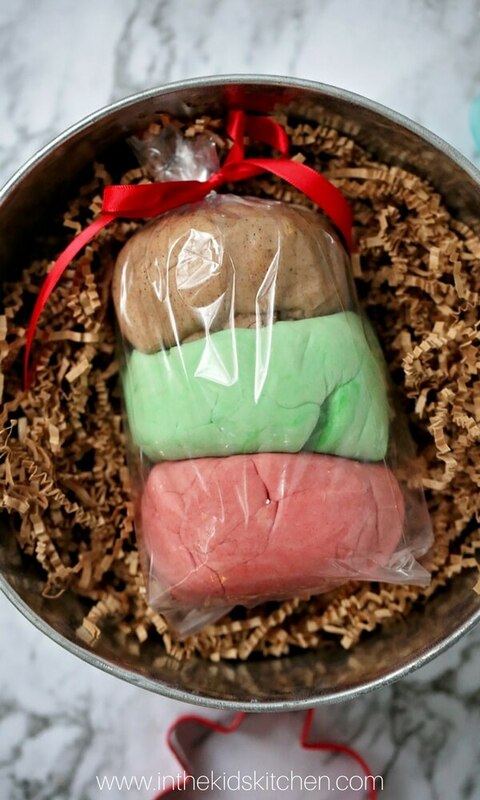 While we usually go for whipped cream, chocolate cookies, vanilla pudding and marshmallows, I thought using vanilla cookies, marshmallows and peppermint cookies would be a fun holiday twist. 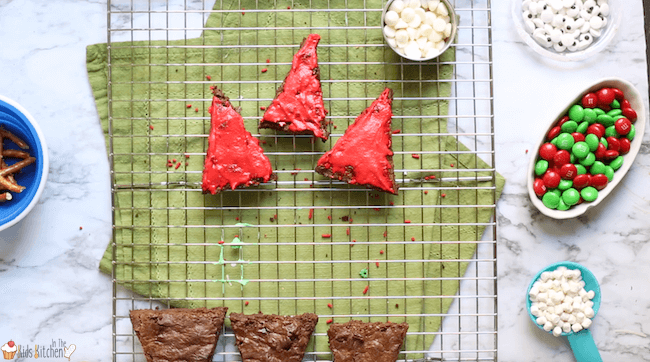 This recipe is for the true peppermint fan, so if you’re not sure, divide your dip in half and add half of the peppermint to one half of the dip and leave the other half plain. 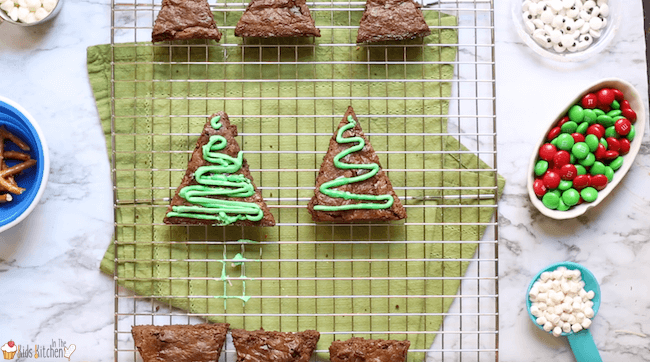 You can always sprinkle on additional peppermint candies afterwards if you’d like! Tip: some people love marshmallow fluff or cool whip in their fluff recipes. We personally liked this consistency for the peppermint fluff, but those additional ingredients would be delicious if you wanted to add them in. Repeat with the vanilla wafer cookies. 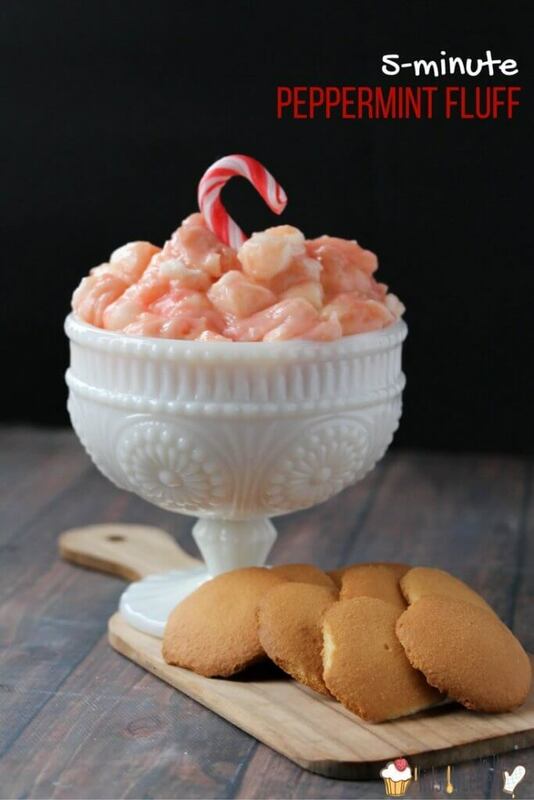 Stir in the crushed peppermints, vanilla wafers, and mini marshmallows. 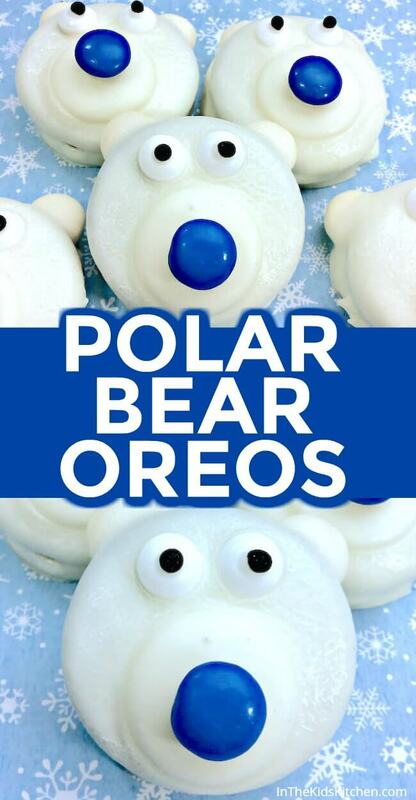 Serve with your choice of dippables – cookies, fruit, etc. If using: Fold in the Cool Whip until just combined - be careful not to overmix. 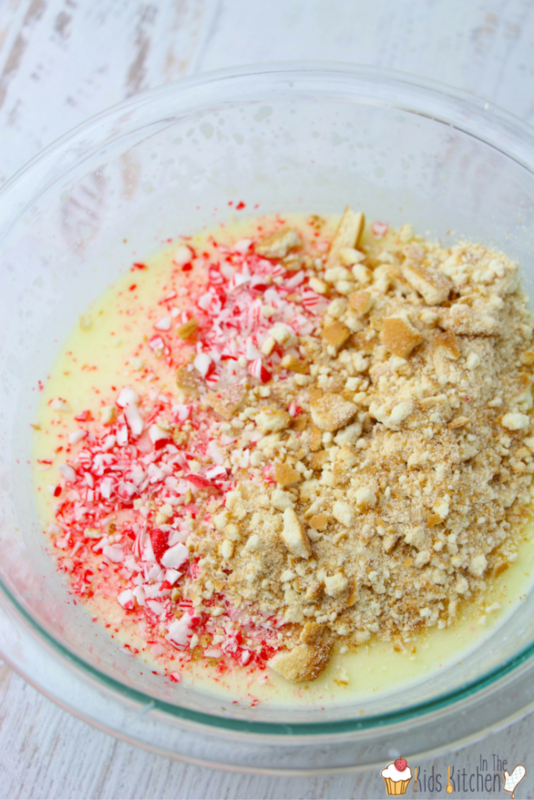 Stir in the crushed peppermints, vanilla wafers and mini marshmallows. 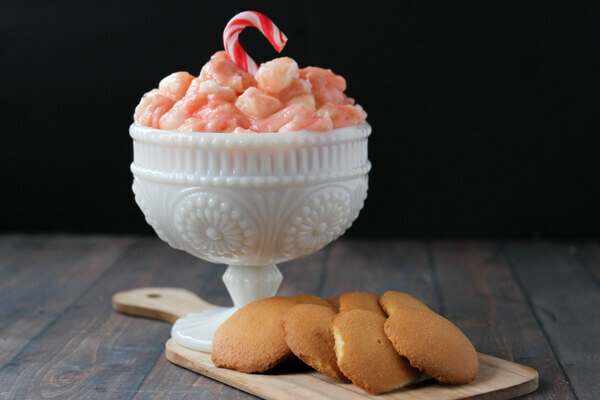 Serve with your choice of dippables - cookies, fruit, etc. 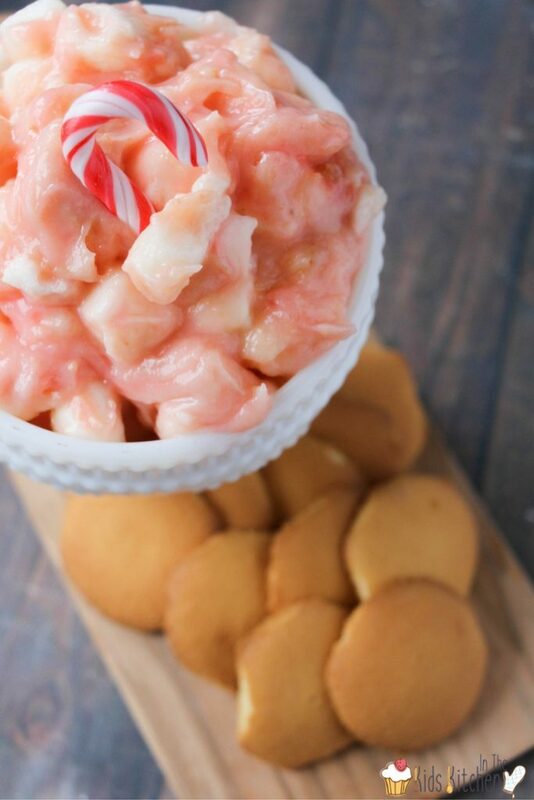 Do you have a peppermint fan in your house that would love this delicious dip recipe?